In early 2018, I signed a deal through VaynerMedia with Johnnie Walker to partner up and become an Ambassador with their fabulous scotch whisky. I was incredibly excited to be collaborating with such a legendary brand. I ecstatically jumped on board with the campaign & got right to work! 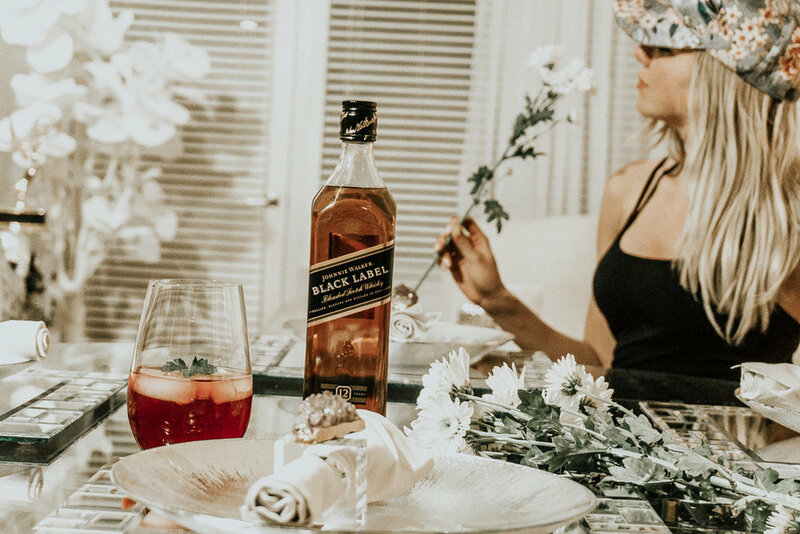 The campaign centers around sharing the delight of Johnnie Walker with all ages, particularly introducing the ways to drink Johnnie with the younger generation. Yes, Walker is delicious on the rocks or neat, but they have opened up a whole new world with mixed drinks! At the end of the blog, I will share my favorite recipe. Once the partnership was official, I began brainstorming setups and shoots to show how I personally love enjoying this drink. From cooling down & enjoying a refreshing cocktail at the beach in Playa Del Carmen to girls day with the ladies to enjoying a hot toddy right on my couch after feeling under the weather, Johnnie was always my go-to! I love the creative work of capturing a photo of a brand that brings people such joy. Behind strategically getting the right shot, to copywriting to editing the colors to capture the vibe, I get to wear many different hats on this project and I LOVE it. Working with such a macro brand has taught me so much. They are incredibly diligent and detail oriented. They know what they want and are not afraid to go for it. The Johnnie Walker community has been fantastic and I could not be more thrilled to have worked with them. I am so grateful for the experience and have had such a marvelous time! Now let's get to the drink recipe, shall we?